We are one of the pioneers engaged in manufacturing, exporting and supplying a wide gamut of Trainer On Thermal Transducers. 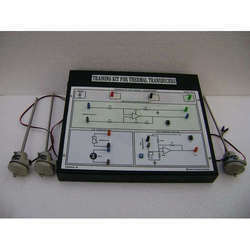 Our product range also comprises of DC Electronics Systems, AC Electronics and Semi-Conductor Devices. Leveraging on our latest infrastructure facilities, we are able to offer a wide gamut of Trainer On Thermal Transducers. This high grade performing trainer is fitted with superior quality Accelerometers, which help to measure vibration transmission through solids and conduct low-frequency structural noise studies. The entire range of products is offered in industry approved grade packaging options. Thus, we are able to prevent any wear and damage during transit. Looking for Trainer On Thermal Transducers ?